This interview took place on: May 31, 2018. Click here for Lacey Sturm's Artist Profile page. JFH (Nicole Vacca): Compared to The Reason and The Mystery, how was your process for writing The Return similar or different? Lacey Sturm: The Reason and The Mystery were written by going back through parts of my life that unfolded as this crazy glorious story, with a clear beginning, middle and victorious ending. The Return is not one long story that has an ending, but it is an intentional reflection on many seasons of my relationship with God that is still unfolding. JFH (Nicole): How do you handle "writer's block"? Lacey: I guess the same way I handle when I lose my voice on tour. I just pray for myself, and in a sort of blind-leap fashion, just try to sing anyway. I just write anyway. Sometimes it's awful [and] it gets thrown out, but most of the time there are gems within the discipline to just get work done that is worth the choice to push through even if it's embarrassing or difficult. But I have to add, one of the points I make in The Return is that staying in dialogue with God is so key when we work. It really should be out of love, faith and rest that we go about our work, recognizing that it's a privilege, an honor and a gift to go on whatever adventure with God he has for us when we say yes to him. And also to trust him when he says no. One time, I had a deadline and needed to write 20,000 words by the end of the day. And I kept feeling like I was supposed to rest and worship and spend the day praying and just being still. The more I ignored the ridiculousness of the feeling in the midst of the circumstance, the more I felt this strife-filled weightiness that comes when I ignore what God is saying. I began to realize that I was ignoring God to check off a to-do list. So I stopped and spent the day obeying this sense of needing to be still and wrote nothing. At the end of the day, I had this invasive thought that I should go over some notes I'd made from a few years ago. When I pulled them up, there was a perfect piece of writing for the chapters I needed to turn in that was 22,000 words! All written and better than anything I could have strived for while ignoring God. So as cliche as it sounds- honestly, my method is prayer and obedience. JFH (Nicole): I really enjoyed seeing your husband Josh's artwork throughout The Return. What was the process like for designing and choosing the illustrations? Lacey: It was difficult for my husband and I to work together on The Return in the beginning, just like it was difficult in the beginning to work on music together. We had to adjust to each other's way of working and it was challenging. But in the end, the process enriched our marriage and relationship and creativity in every way. Josh found a facet of his voice as an illustrator that he didn't realize he had. He ended up just illustrating many things that came to mind as he thought about the subjects of the chapters, and sometimes as he just daydreamed about stuff that had nothing to do with the book. When we pulled all his work together, it all lined up perfectly and communicated the messages so well. I continue to marvel at the way he communicates through design. JFH (Nicole): Reading through Chapter 7: Heart Song reminded me of my current plight with consistently spending time with God. It sometimes bothers me that I look forward to other things more than I look forward to reading the Word and praying. Do you have any advice for believers who see reading the Bible and praying daily as more of a chore than a pleasure? Lacey: I try to begin my time in the scripture with being very honest with God...the way I would if my time with my husband felt like a chore...I'd be honest and see how he responds. Then I would ask God to let me hear what he wants to speak as I read. I would only read until my heart flutters or something makes me stop and wonder...especially if it is offensive in some way. Then I would pray for revelation from the Holy Spirit about whatever it is and 'chew' or meditate on it. I would be careful not to move past it until I learned whatever it was that God was trying to say to my heart or at least found some peace about it. I find so much mental and soul wrestling leads to directions and answers when I pay attention to these moments when they start and pray through them and read more about them. And I'm very careful to not try and just look for the answer I want to hear, while at the same time trusting the Lord is good even when I don't understand, just like I would do with my husband and want him to do with me. JFH (Nicole): What inspired you to include the "Interlude" chapter in The Return? Lacey: Ha! Good question. Well, as I communicate a message in any form -- song or book or even just try and teach my kids something -- I find immediately the message is challenged. Like Jesus said, that the only way we can take a 'speck out of our brother's eye' or teach them or help them is if we can 'remove the log' from our own eye. So the challenge always feels comical to me, because it's like God is saying, "oh, you want to teach people how to steward their gifts? Well, what do you do when I move all the solid ground you're standing on that makes you feel like you know what you're talking about?" I wanted that to come across in The Return. That, even when we think we know how to love God back or steward our lives, God could change all our circumstances in a moment, and we would have to adjust everything we thought we knew. It's important that we know that loving God is not a line-in-the-sand, rule-following, religious fashion-show that makes people feel bad about themselves so we can feel better about ourselves because we know how to "love God." God is not a long dead ancient fable that left us a stack of rules to follow. He is living and active and interactive and invites [us] into a deep and very real relationship. And he is God. We will always need to learn, grow and be humble enough to let him correct and change us from the inside out. I wanted to show that with the interlude...haha...great question. JFH (Nicole): As I read Chapter 12: Light of Freedom & Diamond of Truth, it really drove home for me that, across the Kingdom of God, it is nearly impossible to find two believers who think exactly the same about life, but this is okay since we can learn from one another and most of our differences don't affect our eternal standing with God. How do we live out this truth in a culture where people are easily offended by differences in opinion? Lacey: I guess I really beg God for his eyes to see other people with. I've noticed that the online world seems very offended about so many things, but the face-to-face world is really much more perceptive when they can see our genuine love. I think they are starved for authentic face-to-face Agape, Phileo, and Storge love, and when they see that Love, it is like tasting water in a desert. They are much more receptive than we would expect them to be when we love this way. I think I also try to question myself first, before I question the other person. It helps to remember that God's fingerprints are on all his creation and that difference of DNA and perspective in each one around us is significant to what God wants us to learn from. That should humble us to say, "God, what are you saying through this person whom I don't understand?" Often, it is much deeper than the face-value surface issues we fight so loudly about. When [we] ask this of God, we have to really humble ourselves to receive that growth that each one around us is meant to bring to our souls. I know, for a while, my husband simply prayed daily for God to remove offense from his heart and he really saw a change. As he became 'un-offendable' in most cases, he began to understand and carry God's supernatural love for others. As he does this, people notice and tend to lose offense as well. So I guess the answer is to genuinely love. Lacey: I wanted to show how I grew in practical ways, weekly, in my relationship with God from the time I first encountered Him to now. I read to my boys from the One Year Bible every day, but generally, for my personal time, I like to write out questions I'm wrestling with, and then look for what the Bible says about the things I'm struggling to understand. I find the scriptures dealing with these issues through concordances. I have used Quest Study Bible, The Student Bible, Life Application Study Bible, and lots of other concordances to find the scriptures to answer my questions. I also love the Daily Light suggested to me by Jane Graham, Franklin Graham's wife, who heard of it from Ruth Graham, who read it every day since the age of ten. It's now part of my daily reading as well. But we are actually working on creating a bible study program for people who want to go through The Return together that will come with a journal and scripture suggestions for daily reading. I'm so excited to offer this very soon to people who really want to do a bible study with me! Maybe you could sign up when it comes out? It should be out very soon! JFH (Nicole): There were a few original songs that I have not seen before which you quoted in the journal sections between chapters, like "Sacred" and "Seed Sown in Tears." Will these songs will be released in the future? Lacey: Yes! They will be part of what we are calling "The Return Soundtrack" or something like that. It will be available with the bible study for the twelve weeks we go through it and then will probably be available on its own for people who just want the music. JFH (Nicole): Thank you for taking the time for this interview and for writing The Return: Reflections on Loving God Back. I have one more question: if you could choose any superpower, what would it be? 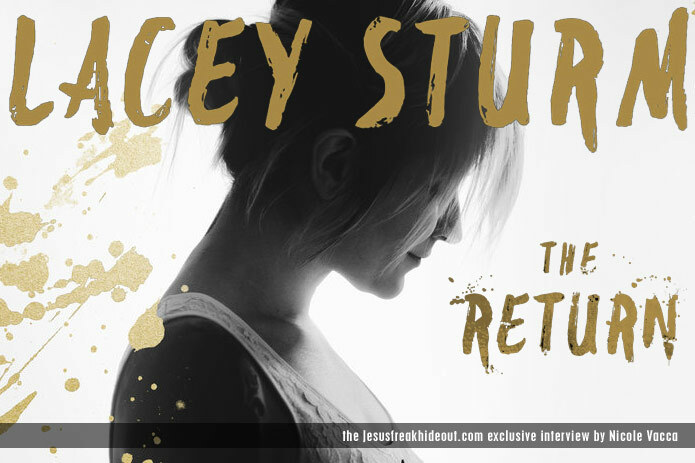 Lacey Sturm's latestc book, The Return is available now wherever books are sold!